Can anything eclipse God’s glory? So, we are in the “path of totality,” dead center for the total eclipse of the sun. It’s a little crazy. Major interstates are closing, people are camping out, hotels are full, and businesses are gearing up for a once in a lifetime opportunity to cash in. The whole idea of daylight sky-darkening-burning-brilliance brings unmatched frenzy, a shivery-tempting eeriness. On August 21, the moon will pass before the sun, sunlight will be covered and shadow will darken our day for approximately 2 minutes. Let the goose-bumpiness be remembered. What an opportunity for families to gather around Bible stories like the plagues of Egypt, when the ninth plague not only blackened the sky but was so thick it could be felt. (Ex. 10). Darkness filled the land for three hours when Jesus was crucified. (Matt. 27:45-50) Scripture paints a dark future with coming events in Revelation. (Rev. 6:12) The 2017 eclipse will be an illustration to children and grandchildren of the unstoppable magnitude of God through history and into the future. For a brief few moments darkness will almost shut out brightness. Light will be nearly hidden. It’s power covered. At times my attention on life’s issues, attitudes, or actions overshadow His light, like an eclipse. Some of the stuff that happens in and around me fills my vision. Truth seems diffused, almost obliterated. And sometimes I feel like the world is at an end, as if evil and ignorance has eclipsed God’s light. 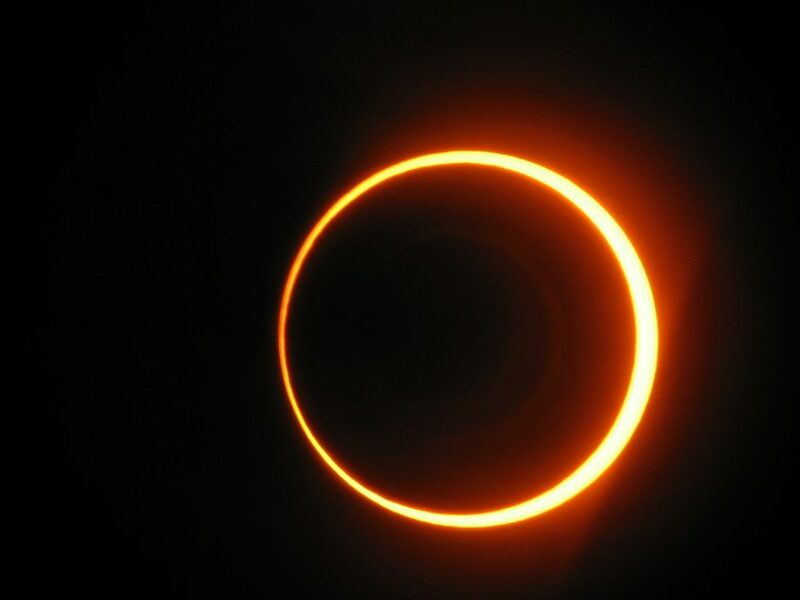 Ekleipsis, the Greek origin of the word eclipse, is an ancient word for being abandoned. Sun worshipers felt the terror of being left alone as their light was obliterated. A world without the brilliant light of Christ is dark indeed. And I question, do I sometimes eclipse His glory? Do I allow things of life to block His brilliance? “… He who is the blessed and only Potentate, the King of kings, and Lord of lords, who alone has immortality, dwelling in unapproachable light, whom no man has seen or can see, to whom be honor and everlasting power.” 1Tim. 6:15; NKJV. The phenomenon of an eclipse points to a Creator who made the heavens and the earth, the One who set the stars in the heavens and the sun to shine. This is an opportunity not just to admire an event, but to remember, to worship and adore God who fashioned all of it. It is a moment in history that gives pause, opens doors to engage others, share faith and rejoice in a Sovereign Lord. His light has not faded no matter what circumstances seem to block our view or darken our skies. It shines just as strong today as when He proclaimed the moon to shine at night and the sun by day. And this glory is reflected in His children. His light cannot be snuffed. It will shine unaltered. God has not changed. He has not abandoned us. We are not left in darkness.This uncontainable God who revealed Himself in Jesus Christ is the light of the world. It is ours to experience, not once in a lifetime, but it shines in our every day. In a few days we’ll scramble to put on our filtered eclipse glasses. We will recognize the science of a great happening. We will be amazed, but we will also look beyond and anticipate greater brilliance ahead. This is only a glimpse. Previous Post What’s Good About Good-bye? Great reminder that even in the darkest of moments, God’s light cannot be snuffed out. Thank you, Sylvia! Note the references to light in this old hymn. Yes! Love that hymn. The eclipse today was an awesome reminder of a magnificent Creator. Thanks!